This is a landmark week for Victoria, with the release of the Royal Commission into Family Violence report. WDV congratulates the Commission on their extensive work and the breadth of their recommendations. After the report's release I gave our initial response to the recommendations for a video which is on Facebook. All the report's 227 recommendations have the potential to support women with disabilities, and WDV is thrilled to see recommendations which specifically address our rights to safety and justice. Many of these specific recommendations follow. Recommendation 15: The Department of Health and Human Services review the contractual arrangements (including funding levels) for crisis supported accommodation to remove barriers for particular groups, such as women with no income and women and children with disabilities [within 12 months]. 87: The Victorian Government, subject to advice... trial and evaluate interventions for perpetrators [within three years] that:... deliver programs to perpetrators from diverse communities and to those with complex needs...and adopt practice models that build coordinated interventions, including cross-sector workforce development between the men’s behaviour change, mental health, drug and alcohol and forensic sectors. 139: The Victorian Government fund Seniors Rights Victoria, InTouch Multicultural Centre Against Family Violence and Women with Disabilities Victoria [within 12 months] to: provide training to equip specialist family violence service providers and providers of universal services to recognise and provide appropriate services to older Victorians, people from culturally and linguistically diverse communities and people with disabilities who experience family violence build partnerships with and provide advice to specialist family violence service providers and providers of universal services to enable them to respond effectively to the needs of people in these communities. 170: The Victorian Government adopt a consistent and comprehensive approach to the collection of data on people with disabilities who experience or perpetrate family violence. This should include collecting data from relevant services—for example, incident reports made to the Department of Health and Human Services by disability services when family violence has occurred [within two years]. 171: The Victorian Government fund research into the prevalence of acquired brain injury among family violence victims and perpetrators [within two years]. 172: The Victorian Government fund training and education programs for disability workers—including residential workers, home and community care workers, interpreters and communication assistants and attendant carers—to encourage identification and reporting of family violence among people with disabilities [within two years]. 173: The Victorian Government, through the Council of Australian Governments Disability Reform Council, encourage the Commonwealth Government and the National Disability Insurance Agency to ensure that all disability services workers involved in assessing needs and delivering services have successfully completed certified training in identifying family violence and responding to it. This could include further developing and mandating the units on family violence and responding to suspected abuse in the Community Service Training Package [within five years]. 174: Victoria Police, in the redesign of the police referral (L17) form, ensure that disability data is collected, including on the type of disability and the support required. Training should be provided to help police members identify how and when to make adjustments for people with disabilities [within 12 months]. 175: The Judicial College of Victoria provide training to judicial officers in order to raise awareness and encourage consistent application of section 31 of the Evidence Act 2008 (Vic), which allows courts to make adjustments to the way people with disabilities may be questioned and give evidence [within 12 months]. 176: The Department of Health and Human Services review the funding model for crisis supported accommodation to remove barriers for women and children with disabilities [within 12 months]. 177: The Victorian Government, in phasing out communal refuges, ensure that replacement accommodation contains disability-accessible units (universal design), where carers can be accommodated as needed and adaptions for children with disabilities are made [within five years]. 178: The Victorian Government extend eligibility for the Victorian Disability Family Violence Crisis Response to assist people with disabilities who are victims of family violence and are not eligible for services under the Disability Act 2006 (Vic) but who nevertheless require assistance. Such eligibility should apply when these individuals do not have access to alternative supports [within 12 months]. 179: The Victorian Government encourage the National Disability Insurance Agency, in the transition to the National Disability Insurance Scheme, to provide flexible packages that are responsive to people with disabilities experiencing family violence. These packages should incorporate crisis supports and assistance for rebuilding and recovering from family violence [within two years]. There are some areas where the Commission has not made specific recommendations for women with disabilities. One relates to accessible housing, although this could be picked up through the Commission's recommendation for a Housing Taskforce. Another is primary prevention initiatives like empowerment programs and employment targets. We hope to see Governments initiate work in these areas through, for example, the next State Disability Plan and the anticipated Gender Equality Strategy. WDV is heartened that women with disabilities were heard through the Royal Commission, through evidence provided by WDV, a focus group consultation, and evidence provided by 'Melissa.' Next week we will release a more detailed analysis of the report via Social Media, our Violence Quarterly and this eNews. 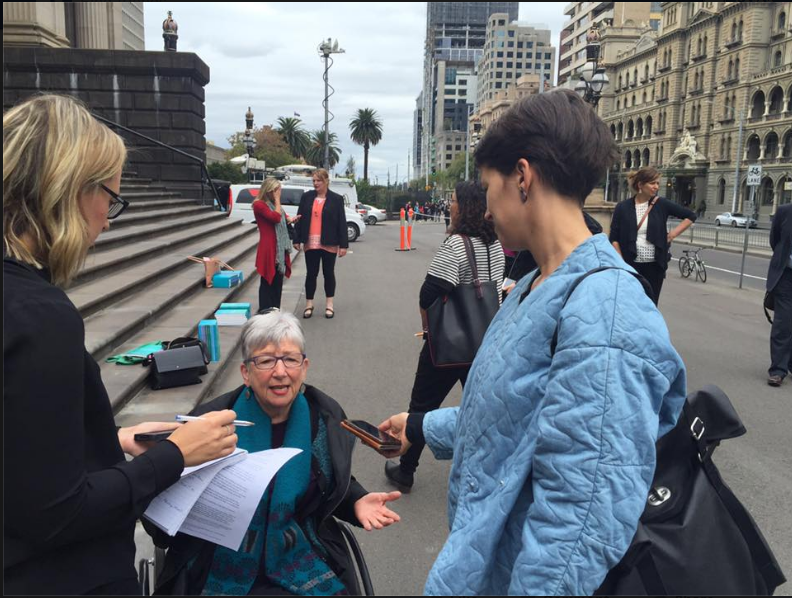 IMAGE: Keran Howe speaking with media following yesterday's release of the Royal Commission's report. Trudy Ryall has been a disability advocate for over 15 years. She is a co-founder of Deaf Blind Victorians. 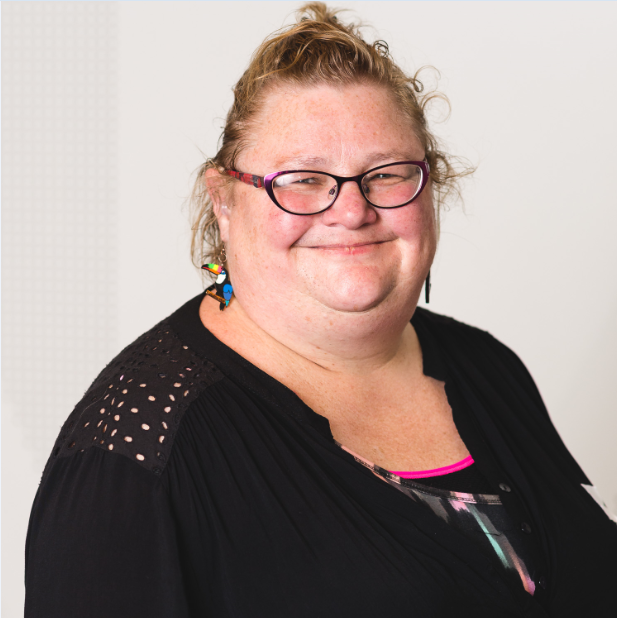 Trudy’s work has been recognised in many ways, including receiving the 2013 BrainLink Women of Achievement Award, the Sir John Monash Award, being a finalist in the National Disability Awards, and being featured in video interview by Deakin University. For this in our series of Management Committee profiles, we asked Trudy a few questions. What made you interested in joining the WDV board? I have been involved in disability advocacy for over 20 years and I am passionate to make a difference. I had recently completed WDV's Enabling Women Program about empowerment and advocacy for women with Jane Oldfield. This inspired me that I can do more by going on the WDV board. I have developed new networks, friendships and skills. and, "Alone we can do so little; together we can do so much." What would you most like to change for women with disabilities? I would like to see FREEDOM for women with disabilities and that they can be removed from any hardship to do whatever they want to achieve in life - whether it is to have a family, work or recreation. Not have physical and social obstacles in front of them such as race, age, language, ethnicity, culture, religion or disability. What does the ideal day involve for you? I love spending time with family and friends to do many recreation activities such as trying out new foods at restaurants, going to the garden show and watching movies. I love walking the dog for relaxation. I go to many meetings, workshops and conferences to increase my knowledge. I am currently studying AUSLAN sign language to increase my communication skills with the deaf and deafblind community. Women with Disabilities Victoria is partnering with organisations in Bendigo to deliver the Enabling Women Leadership Program in May and June 2016. The program is an opportunity for women with disabilities from diverse backgrounds to come together. Women will share their lived experiences and support one another to achieve their goals. The program will run on Tuesdays from May 10th to June 7th. 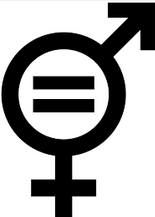 An information flyer and application form is available on our Enabling Women webpage. Applications will be accepted until 12th April. Do you want to be involved in a working group that will guide the development of `Women Leading by Example’ 2 day leadership program being held in August 2016? WDV is looking for up to 8 women to be part of an advisory group. This will include two women from the WDV Leadership network, 2 younger women including one from YDAS and others. The group will meet 4 times for up to 2 hours. The first meeting will be held in mid- April. The aim of the program is to address the disadvantage younger women with disabilities experience post school. This will be achieved by inviting high profile women with and without disabilities to share their leadership journeys and participate in the program. The program will engage with participants in storytelling, shared learning and networking sessions facilitated by the leaders. The program is funded by the Melbourne City Council and the Melbourne Women’s Fund, a giving account of the Lord Mayor’s Charitable Foundation. Members of the advisory group will provide advice on the project’s themes, structures, speakers and evaluation. A $25 sitting fee will be provided to volunteers for each meeting. A young woman with a disability will be employed by Women with Disabilities Victoria as a project officer to implement the program. SBS reports that The Victorian government has announced grants funding designed to support lesbian, gay, bi-sexual, transgender and intersex communities and organisations in becoming more inclusive of people from non-English speaking backgrounds. The LGBTI Multicultural grants are believed to be the first of their kind in Australia, and are being managed through the newly-opened Community Harmony and Capacity Building and Participation programs. Australia Post's Our Neighbourhood Community Grants program recognises the important role of community groups in building connections for people who are excluded or isolated. By providing funding of up to $10,000 per project, the Grants program gives a helping hand to small groups working to build a more inclusive, connected society. Applications close 1 April 2016 at 5pm. Office of Multicultural Affairs and Citizenship is providing medium grants (up to $75,000) to build community capacity to promote gender equality and family safety in culturally diverse communities. OMAC welcomes applications for funding for projects focused on promoting gender equality, women’s leadership, women’s financial literacy, family safety, family violence prevention and family violence service access. Applications close 17 April 2016. Contact Meg Johnston at the Office of Multicultural Affairs and Citizenship on 9651 0639. Children and Young People with Disabilities Australia (CYDA) is running a survey about education experiences of students with disability. The survey closes next Monday 4 April. The Royal Commission into Institutional Responses to Child Sexual Abuse has commissioned the Australian Institute of Family Studies (AIFS) to investigate how survivors of child sexual abuse in institutions and their families access support services. AIFS invites all victim/survivors of institutional or non-familial child sexual abuse to take part in an online survey about their views and experiences of accessing support services. Parents and carers of victim/survivors are also invited to participate. Australia has not had a full time Disability Discrimination Commissioner since the Attorney-General's Department discontinued Graeme Innes' appointment in 2014. It is encouraging to see the full time role will be reinstated, as the Attorney-General's department have called for expressions of interest in the position. WDV's submission to the Victorian Government's Gender Equality consultation calls for a State strategy that includes all Victorian women. A new Victorian strategy must have particular emphasis on developing equality for women who experience discrimination and marginalisation. 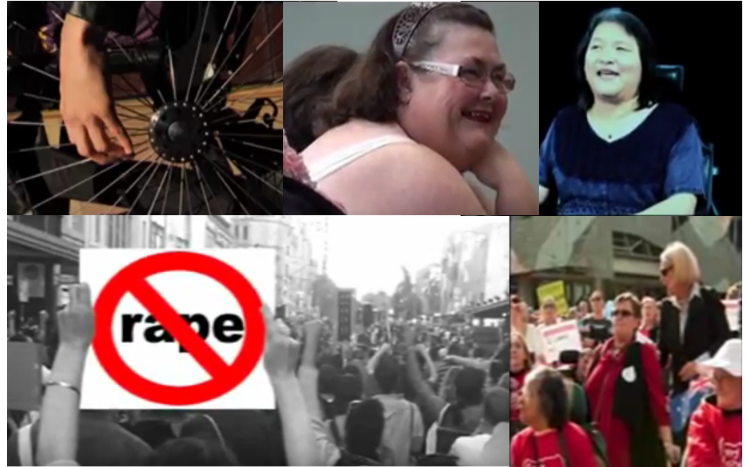 'Dangerous Deeds' videos profile Victorian disability advocates and together make a story of our local movement. Believe us, there are some phenomenal women here! These fantastic short films by SARU bring activists through the internet straight to your screen. Check them out with audio description or captioning.